Sprawling across Central Wisconsin is one of America’s largest freshwater lakes and a marvelous place for RV camping. Lake Winnebago, stretching thirty miles long and ten miles wide, is just two hours north of RV Rentals Chicago IL. Its shoreline hosts such cities as Oshkosh, Neenah and Fond du Lac, giving RV campers even more to do when they come in off the water. In addition to the cities ringing the lake, there are two parks which make visiting even more enjoyable for RV travelers. Calumet County Park on Lake Winnebago’s eastern shore offers RV campers not only easy boat launching, it also has well-equipped RV campgrounds and access to numerous biking and hiking trails. We also recommend a trip to High Cliffs State Park for RV camping near the limestone bluffs that give the park its name. It’s a picturesque setting for camping, hiking, biking and wildlife watching. Another lure of Lake Winnebago for many motorhome campers is the fishing to be found there. Our clients report great walleye, northern pike, lake sturgeon and crappie fishing. If you’ve never been on the water at this huge inland lake, sites such as WinnebagoFishing.com offer detailed information on where and how to catch the most fish. You might also be planning to take your boat when you make your RV journey to the lake. It’s a popular pleasure boating destination, due in part to easy access to the water. If you love to skim the coastline in a kayak, Winnebago offers days of coastline exploration. Powerboating, sailing or pulling skiers across the waves-this enormous lake has a place to do it all. Here’s a website with useful information about the many boat launches around Lake Winnebago. One more way to spend some time getting to know Lake Winnebago is by visiting its lighthouses. Four lights can still be seen on this lake, beginning with the Fond du Lac Lighthouse at the south end. Asylum Point Light on Lake Winnebago’s western shore was never used for navigation, but has long been a landmark for lake visitors. In Oshkosh, Bray’s Point Light sits on private land, although it can be photographed from the city’s Bayshore Drive. One more much-photographed lighthouse on Lake Winnebago is at its northern tip in the city of Neenah, where Kimberly Point Lighthouse has been an attraction since 1945. This is just a taste of what RV camping at Lake Winnebago can be for your family. 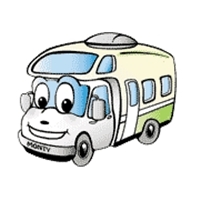 Let us help you with a comfortable RV rental and then get started on your own exploration of Wisconsin’s Lake Winnebago. This entry was posted in Lighthouses, Wisconsin RV Camping Vacation and tagged Lake Winnebago. Bookmark the permalink.